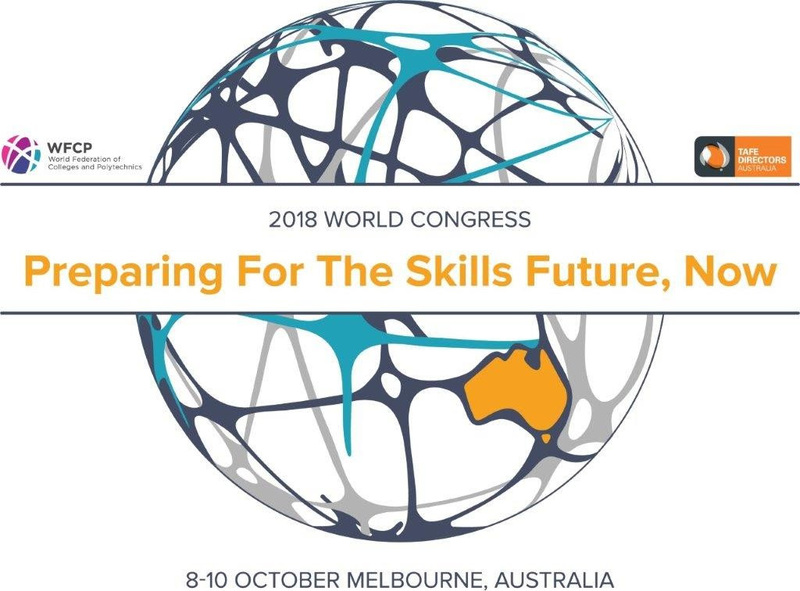 What could Australia learn from Canada’s skills review? The Australian Skills Quality Authority (ASQA) has revoked its suspension of qualifications affecting TAFE SA, saying cases of non-compliance identified last year have been rectified. Following the suspension of 10 qualifications by ASQA in December, TAFE SA lodged a reconsideration application in March. ASQA said that TAFE SA had “expended significant effort and resources in order to successfully achieve compliance…”. South Australia’s Minister for Education John Gardner said this was good news for TAFE SA, students and businesses. “The document identifies that there will be no sanctions on TAFE SA and no suspensions of any courses,” he said. The minister also released the findings of a review by the Nous Group into TAFE SA. “The government will provide a full response to the nine recommendations of the Nous Group, however we note that the report particularly identifies concerns in relation to strategy, governance, capability, culture, systems and resources, some of which contributed directly to last year’s scandal,” he said. Following an article in this newsletter three weeks ago about applied research in Canadian colleges, TDA continues to look at VET policy in Canada. In the 2018 Budget, the Canadian government announced that it would undertake a ‘horizontal skills review’ aimed at maximising the effectiveness of skilled trades and related work experience programs. While this is not particularly noteworthy in and of itself — given the relatively small allocation, as well as the very decentralised nature of Canada’s education arrangements — it is of considerable interest given the excellent performance of Canada’s public colleges, which provide the vast majority of initial VET. It speaks to the importance that the Canadian federal government places on further improving its public VET system, which is a means of ensuring its future competitiveness in an increasingly global economy. 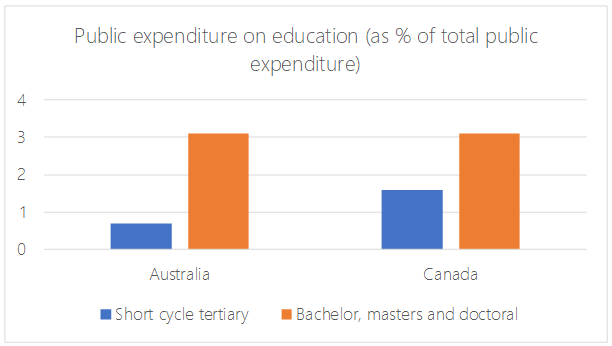 Canada spends considerably more on tertiary education than Australia, both on a per-student basis, and as proportion of total public expenditure (Figure 1). 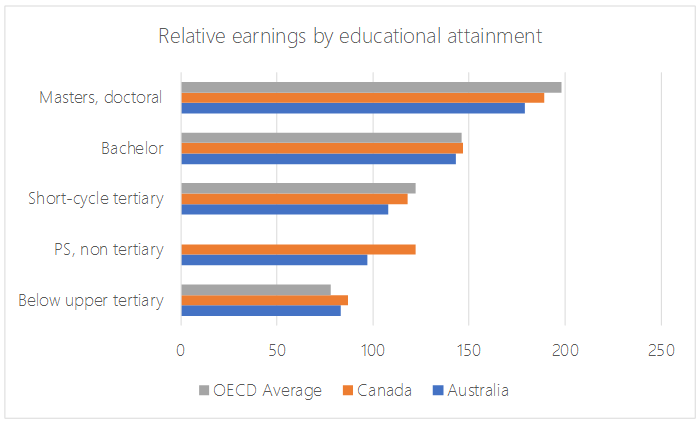 Canadians benefit from higher tertiary attainment than do Australians (56 vs 43 per cent for the working population aged 25-64). Despite the higher overall attainment, wage premia for tertiary-educated workers remain high for all levels (Figure 2). Short-cycle tertiary in Canada tends to be 2 or 3 year diplomas and graduate certificates while for Australia they are sub-diploma (Certificate) level qualifications. In Ontario for example, diplomas and graduate certificates make up 78 per cent of Ontario college qualifications, as opposed to certificate qualifications making up 85 per cent of Australian TAFE qualifications. So is the extra funding worth it? The answer is a definitive ‘yes’. Higher attainment rates in Canada are linked to higher graduate employment rates. Again, for Ontario, employment rates for college graduates have averaged 83 per cent since 2012-13. In Australia for VET participants who were not employed prior to beginning their training employment rates averaged 43 per cent over the same period (Sources Colleges Ontario, NCVER). The extra funding has also paid off in increased engagement of learners with disabilities, who make up 15 per cent of Ontario colleges’ graduate cohorts, compared to just over 10 per cent of TAFE’s government-funded cohort. It also seems the impact of the extra funding sees Ontario colleges attract learners more consistently from higher demographic groups. This speaks, more than anything, to the higher status vocational education in colleges has been able to achieve. So if a country with a very successful public VET system can put some effort toward further improvement, what can we do in Australia? The NSW government has announced fully subsidised training for small businesses through a new $30 million program offered by TAFE NSW. The ‘Skills for Business’ program will provide small business owners and employees free TAFE NSW qualifications in subjects including digital and financial literacy, cybersecurity and general business management. The program is open to all small to medium sized businesses operating within NSW with up to 199 employees, but priority will be given to businesses with fewer than 19 employees. A delegation from the Singapore’s Institute of Technical Education, led by its new CEO, Ms Low Khah Gek, is currently visiting a number of TAFEs across Australia. TDA Secretariat staff had the pleasure of meeting the delegation during its visit to Canberra Institute of Technology last Thursday. ITE is a public VET agency that provides pre-employment training and continuing education across a broad range of subjects to about 25,000 students annually. To reflect Singapore’s global approach, ITE has partnerships with institutes in Canada, the United States and Australia. Western Australia’s South Metropolitan TAFE and mining giant Rio Tinto have entered the next stage of a partnership that will see Australia’s first qualifications in automation. Work has begun on curriculum development under the WA VET Collaboration, chaired by former WesTrac CEO, Jim Walker. The industry input will result in Australia’s first nationally accredited courses in automation, with a Certificate II course primarily aimed at secondary students, and a Certificate IV course to support future jobs. The partnership between South Metropolitan TAFE and Rio Tinto commenced last October, with Rio Tinto contributing $2 million towards the program, which is expected to be delivered for the first time in 2019.